As Heerbode Zahedi narrowed down his degree options, he knew that he wanted to study Law or Accounting, and eventually opted for the latter, which proved successful. 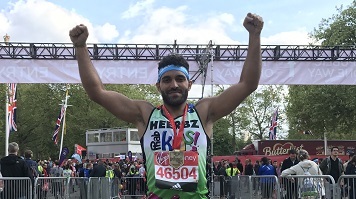 He’s currently experiencing both success in his career and personal life, after recently completing the London Marathon and getting closer to becoming a fully qualified ACCA accountant. However, while he wasn’t exactly sure what he wanted to study, Heerbode did know which university he wanted to attend – London South Bank University (LSBU). Heerbode found that there were a number of advantages to his BA (Hons) Accounting degree at LSBU, not least of which is our accreditation by the Association of Chartered Certified Accountants (ACCA). Heerbode also benefitted from the professional focus of the course in other ways too. Heerbode is also in no doubt that he wouldn’t be where he is today without his degree from LSBU. In the future, Heerbode aims to start his own accounting firm, as well as launching a platform that helps students to develop their employability or start their own business. Maximising potential is something he is clearly passionate about, as is demonstrated in his advice to current students.